Atum is one of the oldest forms of the sun god to to have been revered by ancient Egyptians , and it was this form that Ra was supposed to have created the universe out of chaos . In in temple drawing he was always represented as fully human , without an animal head . He was especially revered because of his association with souls of the dead . He rode in the solar boat during the final hours of daylight preparing to fight his opponents in the night . 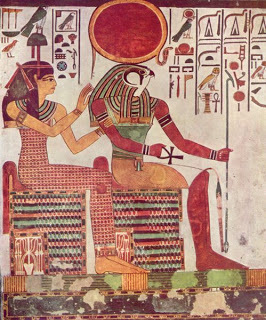 It was believed that souls receive recently released from their bodies waited at the beginning of the valley of the That (the underworld ) for the solar boat , which meat that they came aboard just as sun went down into he underworld the time when the pilot of solar boat was Atum , the form of Ra in the evening.